When I first heard that Beam Suntory was releasing a non-age statement Hibiki named Hibiki Harmony, I was really excited about it. Hibiki is in my mind, one of the best blended whiskys on the planet - and I was really excited to taste the new release. I had the privilege of tasting the Hibiki Harmony this summer, and let me tell you it is really delicious. Its floral with a touch of woodsy peat, honey, brûléed orange, Japanese oak, and fresh stone fruits. Along with the press release came a plug or two for the Hibiki Highball - Suntory's signature cocktail that allows the whisky to breathe and makes each distinct flavor more apparent. It is also a cocktail that respects the whisky. But I wanted to try something else - a Julep. The Julep is a wonderfully delightful cocktail that is really simple and allows the base spirit to shine. But a Hibiki Julep with mint? Heavens no. This Julep would be made with Shiso leaves, the bright green leaves you sometimes see served with your sushi or with the veggies at a Korean restaurant. And....I got busy and this cocktail never happened. But since then Suntory's ambassador Gardner Dunn served a Shiso Hibiki Julep at Tales of the Cocktail, and there have been a few other historic references of Shiso Juleps. None the less, I like to stick to the basics, so this recipe is only herb, sugar, spirit, just like the classic julep recipe. It's a bit of a tricky cocktail because too much water will dilute the whisky too much, and will make you lose the sweet shiso magic at the bottom of the cup. The solution? Don't add too much ice, or wrap your julep cups to help insulate them a bit. 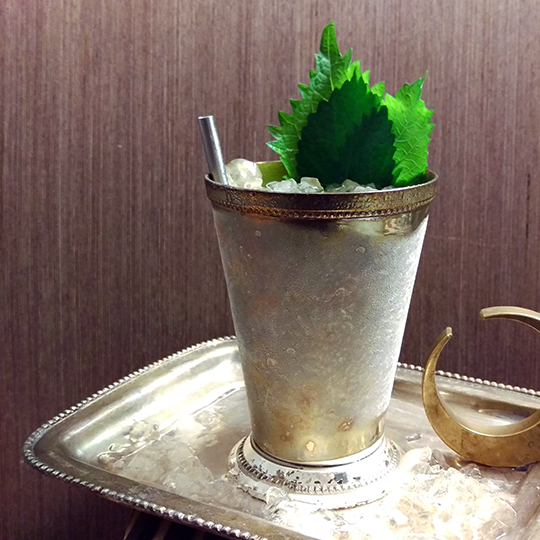 The herbal, slightly minty flavor of the shiso pairs gorgeously with the Hibiki, making this my new preferred julep. Muddle sugar with 3 shiso leaves until macerated. Add 2 oz of Hibiki Harmony, stir, and add 1/2 cup of crushed ice. Top with 1 more oz of whisky, stir, and add more crushed ice. Garnish with a whole Shiso leaf.